Beautiful, brand new rental cabins in Seeley Lake, Montana. Cabins include 1 bedroom with 2 queen beds. Full size futon and rollaway beds also available for additional occupants. Each cabin has a small fridge, microwave, coffee maker and satellite TV. Kitchens also available. 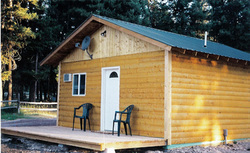 Snowmobiling, hunting, hiking, skiing and biking access available near cabins. Located a short distance from the Bob Marshall Wilderness. Directions: Seeley Creek Cabins are located 50 miles northeast of Missoula on the north end of Seeley Lake. Just 2 hours from Glacier National Park.